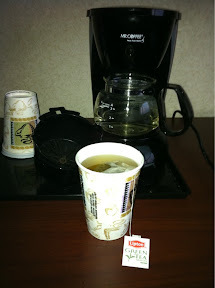 Remove the filter holder (or whatever it's called) in the coffee maker in the hotel room in order to make hot water that does not taste like coffee. Also, carry your own tea bags in case they don't provide any in the room. I love a cup of tea, but hate the taste of coffee. Always Always Always pack a snack (or two. or three. or maybe even four.) You never know when you'll be hungry and the snacks you can pick up for $1-2 at the grocery store will cost you $3-5 on the road. I just arrived in Florida, for my 6th work trip in the last 5 weeks, and I have to say that I've become quite adept at packing and traveling. I figured out what the minimum is that I need (iPhone, laptop, iPod, GPS, Kindle, chargers for the first 4), plus a magazine or book to read during takeoff/landing. Throw in tea, snacks and toiletries (and clothes of course!) and I'm good to go anywhere. If I didn't need my laptop for work trips, I wouldn't carry on anything but my purse. Since I do, I love the rolling computer bag that Bo gave me. It's much easier on my shoulders than carrying it! And, in a pinch, it does just barely fit under the seats when the overhead bins are full.